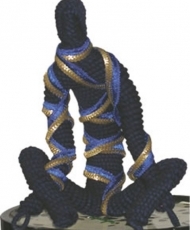 Indigo holds a sustained presence in the post-colonial identity of India. 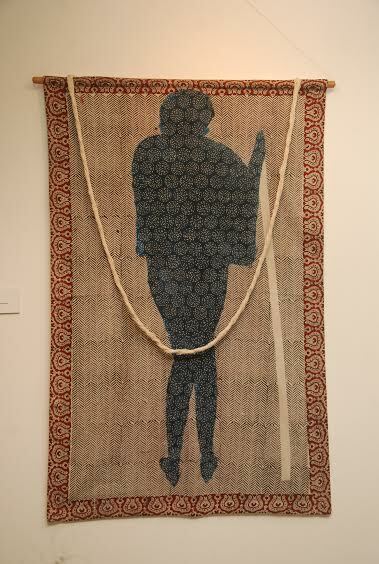 The above installation titled’ Homage: To the Farmers of champaran’ is a varibale site specific textile hanging installation made of sculptural discs with Ajrakh prints. 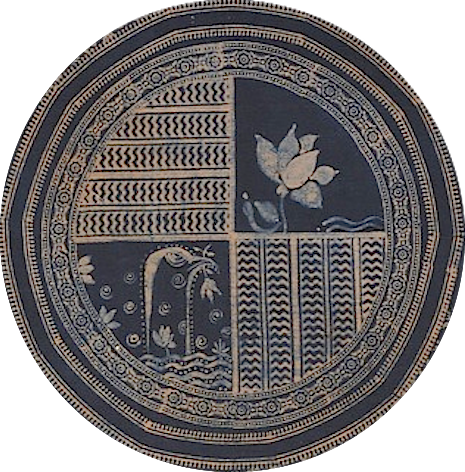 The installation maps the story of ryots of Champaran suggesting of their sorrowful tales inscribed in each circle also representing multiple voices enabling multiple sets to talk the sordid blue farmer story into the sculptural whole. 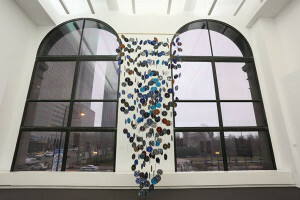 There are 300 or more indigo dyed disks installations hanging are attached to one another, suggesting hundreds of years of subjugation. The parallels of circles hanging with different placement of traditional and contemporary prints also explores the manipulation of visual effect and aesthetics. The above installation Homage: Ballad of blue farmers of Champaran 1917-18 is about 8ft high site specific -displays 16 human structures of 15” height, corded in twisted indigo cotton rope with metallic chains perched on black acrylic painted wooden buttons convey how the native farmers were oppressed for Eurocentric need by colonizers in eastern India. 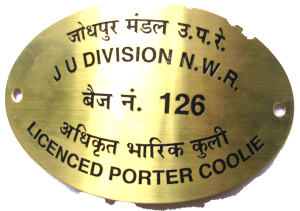 The indigo plantation became deltaic obsession with Britishers after World War 1. The sculptures hanging from top to bottom at different levels suggest their persistent demands to free them from land revenue system as that was leading the native farmers/ families in debts and eventually deaths. The metallic chains around the farmer is suggestive of slavery and oppression and exploitation. 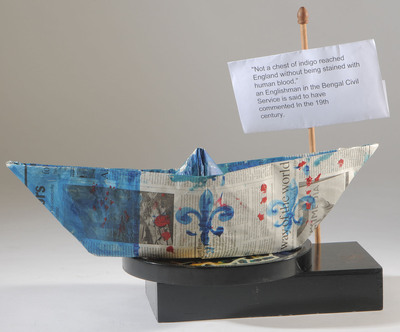 This origami boat is representative of media, translation of story of indigo farmers written by Deenbandhu Mitra(1860). The translated copy from vernacular to English by Madhusudan was sent to British parliament and became a media discussion with elite of Calcutta of bringing awareness of the plight of farmers. The installation sculpture Indigo narratives: Neel coolie jacket is fully structured and fully finished ready to wear, size medium , painted canvas with army print lapels investigating the Eurocentric need of indigo color during the World War I with a brass identification of the porter/coolie on the arm. 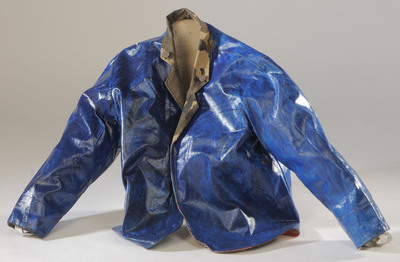 The jacket is constructed signifying the oppression and forced labor symbolically and further investigate the presence of indigo as dye/ color that brings together natural history, science, technology, global economics, politics, spirituality and art in the past with the present. These works draws upon India’s history, literary accounts of oppression on farmers of Chamapran movement in 1917-1918. 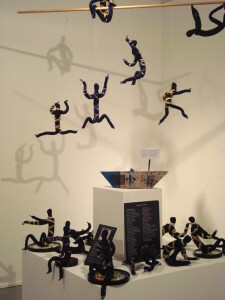 These narratives are inspired by the social, economic and political, historical references and situations affected by the tyranny of British colonial indigo planters on native farmers and Mahatma Gandhi’s subsequent intervention in Bihar, the first satyagarh led by Mahatma Gandhi on the Indian soil after his South African experience of fight against racialism. In the 19th century, Bengal was the world’s biggest producer of indigo but today, the deep blue color of indigo is synthetically created in a lab and is associated, in the West, with blue jeans more than its torrid colonial past. The works engage textile reference of ajar printing and dyeing of coastal Gujarat, literary texts such as Neel Darpan through the history of India’s colonial past along with references to indigo plant/color/dye. 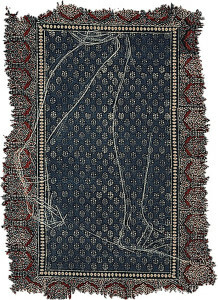 The use of azrak printing on khadi in my works is examining the immigrants with indigo technique which came along with them. I examine the implication of personal, political and cross cultural choices of communities that migrated from Sindh and Baluchistan with the craft of indigo, with a strong narrative element to create and yet preserve their identities. I create a cultural context of my work by narration of ‘Neel darpan’ through visual medium. I went and worked with 9th generation Azrak artisans in Bhuj in interiors of Gujarat on khadi fabric with ancient indigo resist printing technique with contemporary prints and ideas of 2009. My works interpret the politics of indigo with objects, sculptures installations and paintings within my Indigo narrative 2009-2017 series. 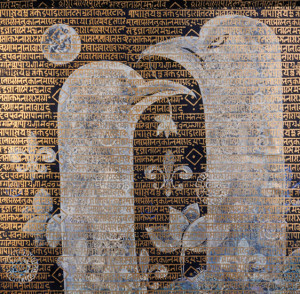 Between 2009-14 these works in this series traveled to seven venues in India and the U.S. as part of a two-woman show ‘Indigo: Shelly Jyoti and laura kina’ including Chicago cultural centre, IL. It has recently re- opened in India at the Museum of National Archives of India.